The development of a new information Systems Development for Reef Adventures, a bareboat charter business based at Airlie Beach. Some problems have been noted regarding the current system used for the business. A single staff can access the records at a time. The records are also difficult to handle. Moreover, the system hardly provides any effective way for keeping demographic data of the customers. Due to all these problems, High Voltage Information Services has developed a new integrated information system for the cruise company. The new system unites all the main elements of charters and equipment hire. SDLC is composed of some clearly defined and distinct phases used by system developers in order to plan, design, make, experiment and deliver information systems (Devlin and Murphy, 2013). An SDLC aims to create high-quality information Systems Development, which can successfully meet the expectations of the customers by delivering effective systems, which move through clearly defined phases within the scheduled periods and cost estimates. In order to manage the complexity of the computer systems, various SDLC methodologies or models are developed like “spiral”, “waterfall” etc. 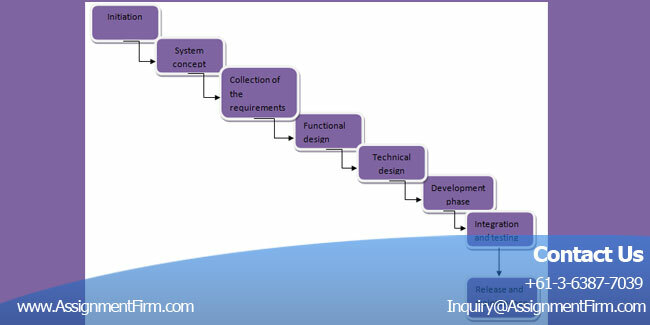 The steps or stages of the SDLC models include initiation phase, Systems Development concept stage, collection of the requirements stage, analysis of the functional requirements phase or functional design phase, technical design stage, development stage, integration and testing phase, release phase and maintenance phase (Al-Zahrani, 2006). Generally, these phases hardly step over each other. It can be said that each phase starts after the completion of the previous phase. At the end of the each stage, stakeholders decide to move to the next stage. Simply speaking, the stages of SDLC are planning, designing, testing and implementation, maintenance. At the first stage planning, objectives of each of the activities are developed. Requirements are collected from the clients to analyze the requirements. After the establishments of the requirements, the software is designed. In order to do so, the operating system the language and hardware components need to be known at this stage (Satzinger et al. 2012). At the implementation stage, software engineers program the code for the project. At the testing stage, the defects of the design are recognised. Deployment starts once the code is tested and approved for release. On the other hand, Agile Development Methodologies also follows the same phases that are mentioned above. The main principal of the development methodologies are similar. The key difference is every piece of requirement either dependently or independently follow the above-mentioned phases. Agile Development Models are iterative and encourage developing necessary solutions continuously (Turner and Weickgenannt, 2013). In this process, stakeholders need not sign off at the end of the each phase. Instead of this, approvals from the stakeholders for each requirement are more suitable to push the piece to a next phase to support the dynamic nature of the Agile Development. For developing a new Systems Development for Reef Adventures, Agile Development approaches have been chosen as traditional approaches are criticised severely as the traditional approaches including SDLC involve sequential development. In accordance with Langer (2008), it is not effective to develop software like an automobile on an assembly line, in which each phase depends on the previous phase. For this reason, phase based approach like Agile Development needs to be used, in which all the project requirements are collected first and then all the designing are completed. Agile Developments offer opportunities to assess the direction throughout the development life cycle (Rivard et al. 2009). In order to use Agile Development approaches for Reef Adventures, it is very important to identify the functional and non-functional requirements for Reef Adventures. The system will be based on the analysis of the functional and non-functional requirements. Functional requirements define what functions need to be done in order to meet the objectives of the mission. It is very important to make the functional requirements clear and consistent so that the system developer can understand the requirements easily (Hillard, 2010). In addition to this, the requirements also need to be practical, correct, flexible and without ambiguity. The functional requirements of Reef Adventures are—the system should include useful means for keeping the demographic data, contact details, preferences of the customers; the records need to be accessed by more than one person at a time, instead of using both paper and electronic records, only electronic records need to be maintained with back up of the records. The basic functional requirement is the system needs to tie all the key elements of equipment hire and charter together. Generally speaking, the non-functional requirements are the requirements that determine the criteria that can be used in order to measure the operation of the Systems Development. Unlike the functional requirements, non-functional requirements specify the criteria. Functional requirements specify what a system needs to do and the non-functional requirements specify how a Systems Development is supposed to be (Eyer and Whitaker, 2012). The non-functional requirements are also known as quality of service requirements or technical requirements. The non-functional requirements that will measure the operation of the Systems Development are accessibility, privacy, security, reliability, back up, availability, quality, and online documentation etc. The customer records need to be accessed by more than one staff. Information regarding the customers requires being private and secure. The system should ensure that contact details of the customers cannot be accessed by a person other than the staff. As the records will be maintained via electronic medium, it is important to keep an easily accessible back up of the records. The cost benefit analysis and evaluation is prominent tools that is been implemented in a project to investigate the prominent strengths and weaknesses of the alternative resources that is been allocated in relation to making certain impact in the completion of the project in a relevant and efficient manner. The engagement of cost-benefit analysis in the preparation of the project is been involved in relation to evaluate and estimate the alternative options and series of actions to be chosen for the organisation to make certain approach and practices in the project (Davis and Yen, 2009). The techniques subsequently evaluate and estimate the reliable decision making that enhances the project activity more relevant and sufficient manner. In relation to making engagement of proper labour, resources time scheduling, cost estimations the cost-benefit analysis measures, monitors and evaluate the best possible cost to be engaged to complete the particular project within a provided budget with proper involvement of quality resources and labour engagement to meet the project objectives more relevant and successful manner. The purpose of Cost benefit analysis and evaluation includes making a effective and efficient investment in the project. It has been used in relation to make a relative comparison abased on the fixed costs, expenditures with other project in relation to estimate the profitability. As per Kendall and Kendall (2011), there are the valuation of the cost benefit analysis and evaluation certainly provides positive as well as negative results that engages impact in the participants of the project. It certainly makes an impact on the optional valuation and social beneficial effects of the company. The major factors of cost benefit analysis are stated to be time and descanting that is been engaged time valuation of money to estimate the cost effect of the activities to be progressed and cost consumption to be engaged in every project activities. Another relevant factor that is been engaged in the cost benefit analysis and evaluation is risk and uncertainties that evaluates the project outcomes to analyse and evaluate the probability and possibilities of uncertain events that might make hindrances in the progression of the project (Kottemann, 2009). The main stakeholders of the Reef Adventures are the customers, employees and suppliers. The staff or the employees of this cruise company include receptionists, who finalise the requests of the charters, a qualified diver, manager and other employees. The staffs are important stakeholders as they provide cruise service to the travellers and run the business. The customers of the Reef Adventures are the most important stakeholders. The new system is developed for the employees so that they can easily record the details of the customers, charters and equipments hire. Another stakeholder of the company is their suppliers who supply effective service to the company. High Voltage Information Services is also one of the stakeholders of the company as it offers effective service like implementation of information system. There are various techniques of collecting information. Sometimes, a combination of the techniques is also used to collect required information. In order to deliver effective system to Reef Adventures, it is highly required to collect information regarding the requirements of the company and the problems regarding the current system. The investigation techniques include observation, questionnaires, organisation charts, existing documentation, sampling, manuals or handbooks, record searching, interviewing etc (Smith, 2010). In order to collect required information regarding the requirements of Reef Adventures, interviewing, questionnaire and existing documentation have been selected. The selected investigation techniques are effective in the context of Reef Adventures. In order to find the functional and non-functional requirements of the company, Steve Rogers, the proprietor will be interviewed. As Steve administers all aspects of the business, he can clarify the requirements to the service provider. The questionnaire is also an effective method of collecting information in this context. The staff will use the newly developed service. Therefore, it is important to know their opinions. The main advantage of this technique is that data can be gathered from a large number of respondents. Existing documentation is also a useful method for gathering data. By reviewing the existing documentation, the problems associated with the current system can be analysed easily (Wang, 2012). The project can be considered a successful as High Voltage Information Services has been able to deliver Reef Adventures a newly developed information system within the scheduled time. The positive feedbacks of Steve and the other employees prove that they are satisfied regarding the new system and the service provider fulfills all of their requirements. It has become possible as the suitable techniques were chosen to gather information regarding the requirements and problems of the current system. Though the project is successful, it cannot be said that it is extraordinary. High Voltage Information Services worked considering the budget and schedule of the project. If more time and money were given to the company, the developed system would be successful in exceeding the requirements of the client. The findings of the project include information from the existing documents, questionnaire and the interview of Steve. The investigation techniques revealed that the current system is complex and difficult to handle by the employees. There is no scope of maintaining the demographic profile of the customers. Records are kept both in electronic medium and in paper. By using the current information system, it is difficult to maintain the contact details of the customers.